anywhere automatic barriers or gates are present. a product compatible with all main access control systems, smart, with an independent automatic system. Remote-controlled IP camera with optical character recognition (OCR) software for automatic number plate recognition (ANPR). This means the camera automatically reads the number plate of any vehicle: cars, motorcycles, lorries, motorhomes, buses, ambulances, law enforcement vehicles, etc. Unlike TARGA 512 camera that is fitted with a fixed focal-length lens, TARGA 504 is equipped with an adjustable varifocal lens (10x zoom) that enhances its accuracy. It also allows more flexibility when placing and adjusting the camera, both in the installation and in the set-up phase. TARGA 504 is highly accurate when reading number plates of vehicles travelling at moderate speed. 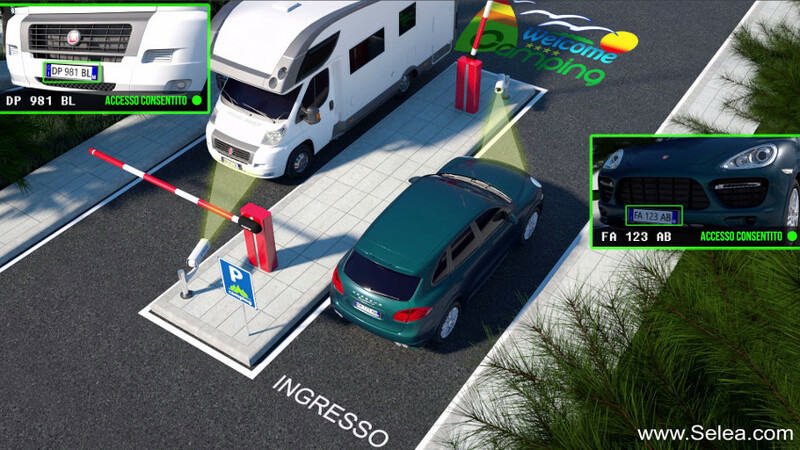 Thanks to its internal memory, TARGA 504 camera can store special lists of authorized vehicles (white lists), therefore working as an independent access control system, without the need of a computer. Its software checks and updates white lists, allowing access to vehicles even in the event of a computer shut-down or of an interruption in the connection between the camera and the operations centre.